Product prices and availability are accurate as of 2019-04-24 22:36:32 EDT and are subject to change. Any price and availability information displayed on http://www.amazon.com/ at the time of purchase will apply to the purchase of this product. A better way to learn statistics?see how a story can change learning outcomes! Shortlisted for the Association of Learned & Professional Society Publishers Award for Innovation in Publishing 2016! An Adventure in Statistics: The Reality Enigma by best-selling author and award-winning teacher Andy Field offers a better way to learn statistics. It combines rock-solid statistics coverage with compelling visual story-telling to address the conceptual difficulties that students learning statistics for the first time often encounter in introductory courses?guiding students away from rote memorization and toward critical thinking and problem solving. Field masterfully weaves in a unique, action-packed story starring Zach, a character designed to think like a student who processes information, and the challenges of understanding it, the way a statistics novice would. 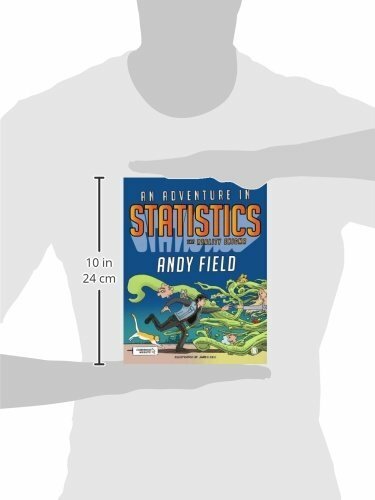 Illustrated with stunning graphic-novel style art and featuring Socratic dialogue, the story captivates readers as it introduces them to concepts, eliminating potential statistics anxiety. Providing a vibrant alternative to the dullness of many typical offerings, the book assumes no previous statistics knowledge nor does it require the use of data analysis software. It covers the material you would expect for an introductory level statistics course that Field’s other books (Discovering Statistics Using IBM SPSS Statistics and Discovering Statistics Using R) only touch on, but with a contemporary twist, laying down strong foundations for understanding classical and Bayesian approaches to data analysis. 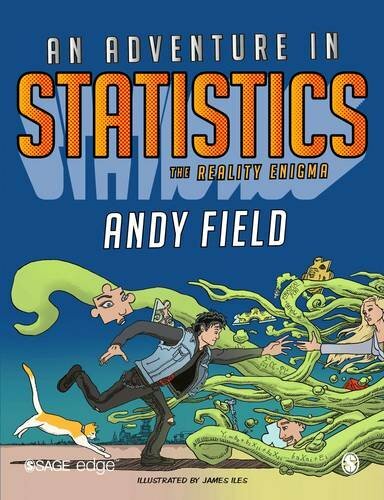 Compelling graphic novel-style story and illustrations (by an illustrator from the Doctor Who show) introduce and apply statistics concepts gradually, keeping students engaged from the start. Readers are so enthralled by the story and the characters that they "forget" how much they are learning along the way! "Student-to-student" approach addresses the conceptual difficulties that students learning statistics for the first time often encounter because the main character in the story is designed to think like a student who processes information, and the challenges of understanding it, the same way a statistics novice would?guiding readers away from rote memorization and toward critical thinking. In the Next Chapter, Zach Discovers sections offer a sneak preview of what comes next. Reality Check features explain new concepts in an easy-to-understand, unintimidating way. Check your Brain exercises throughout the chapters offer opportunities for students to apply what they’ve learned, enhancing critical thinking and problem-solving skills. Figure boxes in the margins bring concepts to life as they direct readers to visual representations of the material without interrupting the flow of the narrative. Zach’s Facts recap chapter key concepts and offer another opportunity for targeted review. Milton’s Meowsings promote critical thinking and include humorous letters (from Professor Milton Grey to Zach, the main character) giving more insight into how students could approach solving different statistical questions and how those approaches affect the outcome.